We know that it is undesirable to be wasteful – whether it is in terms of water by leaving the tap on, or electricity by forgetting to turn off a device or food by letting it get spoiled. Yet we often let ourselves be wasteful as regards our mental energy: by being wistful. When we needlessly lament or long for things that haven’t turned out right, what are we doing other than wasting our mental energy? Such wistfulness rarely leads to anything constructive. All it does is distract us from the present and make us dissatisfied. 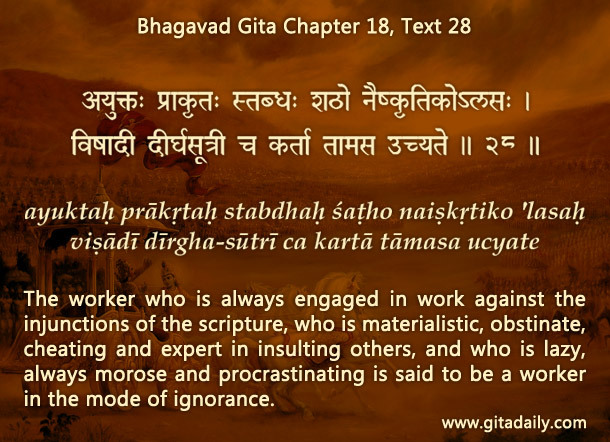 The Bhagavad-gita (18.28) points to such needless moroseness (vishadi) as characterizing those in the grip of the mode of ignorance – the mode that keeps us farthest away from our enlightened, ecstatic spiritual nature. How can we overcome the tendency to be wistful? We all have many gifts to be grateful for, if we just look at the many people in the world who have far less that what we have. Though we may intellectually understand the undesirability of being wistful and the desirability of being grateful, it is difficult to emotionally accept and regularly sustain this feeling. The difficulty is because such gratitude is characteristic of nature’s higher modes, especially the mode of goodness. This illuminating mode enables us to see beyond the clamor of inner sensual desires and the glamor of outer sense objects. The easiest way to remove ignorance and cultivate not just goodness but also transcendence is by practicing bhakti-yoga. This yoga of love connects us with the all-attractive Supreme Person, Krishna, who is the source of all positivity and joy. The more we think of him internally and serve him externally, the more we discover lasting inner fulfillment, thereby uprooting all wistfulness.